"'My power depends on my glory,' he said, 'and my glory on my victories.'" 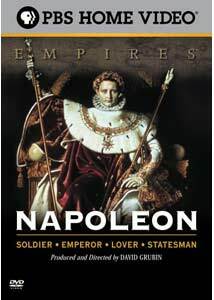 Napoleon remains one of the towering figures of the last 200 or so years; his exploits in becoming the most powerful ruler in Europe, followed by his eventual downfall, form a compelling tale of genius and hubris. There have been films about the emperor and non-fiction studies alike, such as this PBS documentary from 2000. Re-released in conjunction with the PBS film about Marie Antoinette to capitalize on the Sofia Coppola film, writer/director David Grubin's work is a bit dry but will provide the newcomer to Napoleon's story with a solid background. Part One is titled To Destiny, wherein we see the young Napoleon rise from his relatively anonymous birth on the island of Corsica, where French rule leads him to military school in France, where he becomes a regimental officer. With the onset of the French Revolution in 1789, Napoleon takes his place in the army, and by 1795, is called upon to put down another uprising, which he does, consequently earning himself the rank of full general at only age 26. He meets Josephine, his future wife, and continues his ascent. In Mastering Luck, Napoleon manipulates his public image to his advantage, using propaganda to earn the goodwill of the people. His first major failure comes in his expedition to Egypt, where the British strand the general with 30,000 soldiers. Napoleon, having conquered Egypt, is still able to spend time leading academic studies of a land mysterious to much of Europe at that point. By 1800, his fortunes improve through a military coup in which he is installed as part of a trio of ruling consuls, to be him alone by 1803. Napoleon now rules France as a king in all but name, and starts the work of improving the nation. He carries out many public works, and institutes a code of laws. By the time he crowns himself king in 1804, his power in just reaching its peak, with more glory to come. The third part is the Summit of Greatness, in which Napoleon brings much of Europe to heel through a series of bold victories in the field, despite the looming presence of the English. The Battle of Austerlitz is the capping victory, as the French defeat a coalition of Austria and Russia. The next several years see Napoleon place family members as puppet rulers in several thrones. The end is approaching, however. In The End, the emperor's arrogance gets the better of him, as a bloody war with Spain and then a devastating invasion of Russia hobble the French. The various European states, joined by the English, eventually force Napoleon to surrender the French throne in 1814, and Napoleon is exiled to the island of Elba. He awaits opportunity to return, and it comes as the restored Bourbon monarch Louis XVIII flounders on the throne. Napoleon escapes and regains power, but sees final defeat at the battle of Waterloo, where he is vastly outnumbered. This time, the English make sure he will not escape again, imprisoning him on the deserted isle of St. Helena, a lonely spot in the South Atlantic. Napoleon would die after five and half years of captivity, his legend ensured. Like most such PBS offerings, this is basically comprised of talking head historians coupled with David McCullough's narration over paintings, drawings, and occasional brief re-enactments. At nearly four hours in length, it can get a tad dry, but the story is interesting enough that attention never wanes completely. Still, varying the narration with some actors' readings might have livened things up a bit. Stylistically, the template has been set and this doesn't really deviate from it. It has a goal, to tell the biography of Napoleon, and it does it in a straightforward manner. Image Transfer Review: Like previous PBS documentaries, this is presented in 4:3 letterbox, and it has a slightly smeary look on occasion. Adequate, but certainly room for improvement. There are no subtitles. Audio Transfer Review: This is mainly talking heads and narration with occasional underscore, so little is required of the 2.0 soundtrack. It does the job without problem. Extras Review: A brief (05m:35s) featurette is the only extra; it's pretty insubstantial, relating to the filming of some of the re-enactments with a few general comments thrown in. This is a by-the-numbers PBS documentary, so if you like that type of program, and have an interest in Napoleon, you'll likely be entertained. Napoleonic experts probably need not apply, though they may want to hear from the plethora of experts brought in to comment. The DVD is solid, but lack of anamorphic enhancement continues to be a problem with PBS releases.